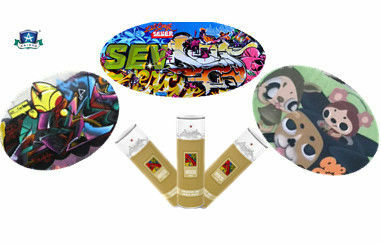 Aristo Graffiti Art Spray Paint is a professional paint designed for artist. 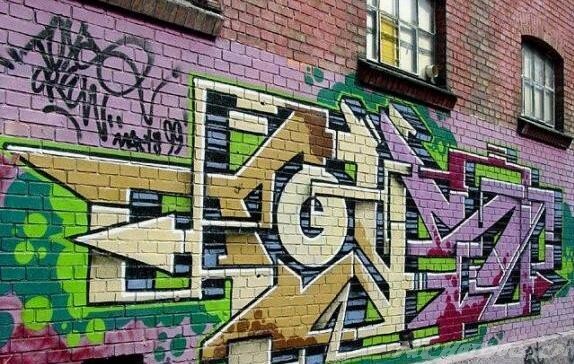 This versatile, fast drying spray color provides excellent opaque coverage of pure, brilliant color, and is lightfast for at least 10 years.The spray cans work with a level cap system, allowing both low- and high-pressure performance in the same can.The flexible, acrylic-based formula works well on wood, concrete, metal, plastic, canvas, glass and many other surfaces. By just changing the cap, artists can go from low-pressure output for working in thin lines and fine detail, to high-pressure with a high output for easily filling in larger areas. It is suitable for indoor work, as the atomized spray is reduced to a minimum and is nearly odor-free. Aristo grafiti spray paint provides superb handling along with the most extensive range of multi-colors in flowing gradients for shading; perfect for photorealistic works. The paint is also 100% lead and CFC free. The cans feature a colored ring at the top of the can that identifies the color inside and may also help the artist visualize the color mix of their artwork. The acrylic-based formula allows for ease of working in mixed media. 2. For uncertain target, please try spraying a small area. 4. The product is flammable. Stored in a cool and dry place at the temperature below 40°C. Away from heat. 8. If sprayed on eyes, please clean it immediately with water and turn to doctor for help.